Like the title says, you can now access the forums using the Tapatalk iOS or Android app. The app is currently free (Android version is free at the Amazon Appstore) so grab a copy now if don't already have it. Ugh, I have to install the Amazon App Store, create an account and open up all sorts of settings on my phone to Amazon, who is currently linked to that NSA scandal... I think I'll just keep using the basic site. awesome. Now I can post twice as much. "However, if Verizon, which is Order No. 80, and the first quarter got order No. 1 — then there can be as many as 79 companies involved. So somewhere between 40 and 79 is the number of companies, Internet and telecom companies, that are participating in this data transfer in the NSA"
However you access Dallas-mavs it's too late. 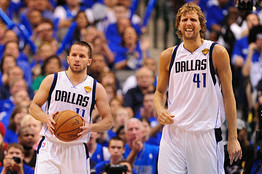 They already know all the disgusting things we would like to do with Dirk. So I should take the foil hat off of my head and put it over my junk? Gotcha. You can always get Tapatalk 4 (latest beta release) for free at Google Play. Thanks, that seems to work better... Although the functions are pretty limited, mostly just text. It's pretty straightforward though. EDIT: I think I still prefer the full site, but this is a nice, quick option. Last edited by Underdog; 06-18-2013 at 10:58 AM.